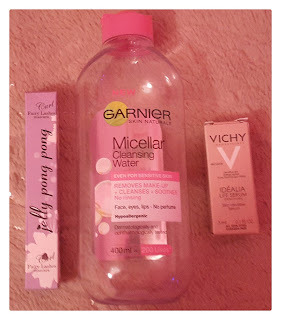 As you can tell from the title, today's blog post is going to be my product empties. I've built these up for about three months so I thought I would share these with you. Note: I also want to mention about how bad quality the pictures are! I am so sorry. I took the pictures, and without actually looking at them I through-out all the bottles etc and then came on my laptop to edit the pictures and the picture quality, as you can see, isn't the best so please just bare with it for this blog post. As you can see I've been using a lot of Dove body wash products over the past few months and they really are my favourite. 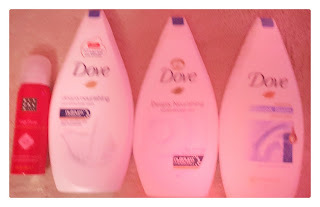 I love how moisturising and soft Dove products make my skin feel. The last one that isn't really good pictured is Rituals Yogi Flow foaming shower gel. This stuff is amazing, it foams up so much and smells incredible. It has ingredients in it are things like sweet almond oil and Indian rose which makes my skin so moisturised and luxurious. 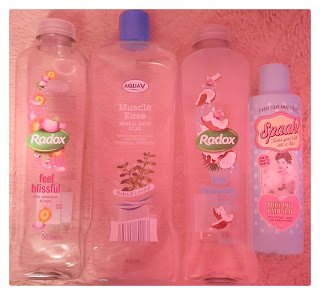 I'm a massive fan of bubble baths and bath soaks, and although my favourites are the Radox range I've been trying to use a couple of new ones. 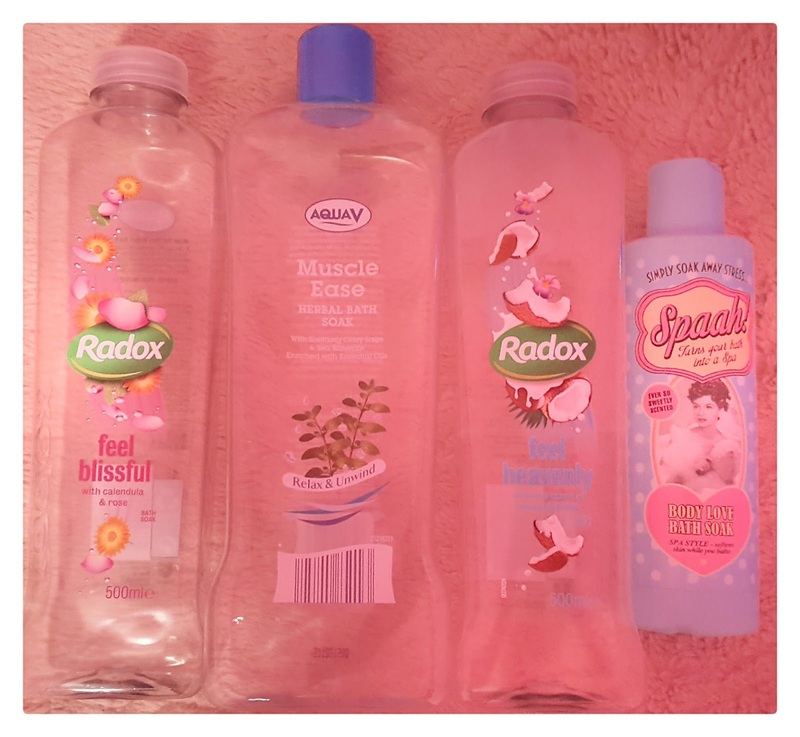 The Radox bottle on the left* is my favourite bath soak of all time, the AquaV bath soak is Aldi stores own range which really relaxed me each time I used it. The next one is another Radox product which smells amazing of coconuts. The only problem is that this product is that it made my skin really oily. Lastly, is a bath soak I picked up for only £1 in my local PoundLand store. This Spaah! style bath soak is enriched with skin smoothing Aloe Vera and is gently scented with pomegranate fruitiness to help you switch off from the world and leave skin sily soft. It's the perfect pre-bedtime treat. I would recommend everyone to try this, it is kind of hard to get hold of as PoundLand stores no longer stock it but you can buy it by clicking here if you live in the UK or USA and by clicking here if you live in Europe. I adore body scrubs. They are an essential for me when having a bath or shower. This body scrub from The Body Shop was bought for me by an Auntie Sharon, it smells amazing and really is one of my favourite's on my skin. The smaller body scrub was bought for me by my friend Keri and although it was made with salt I really liked it. 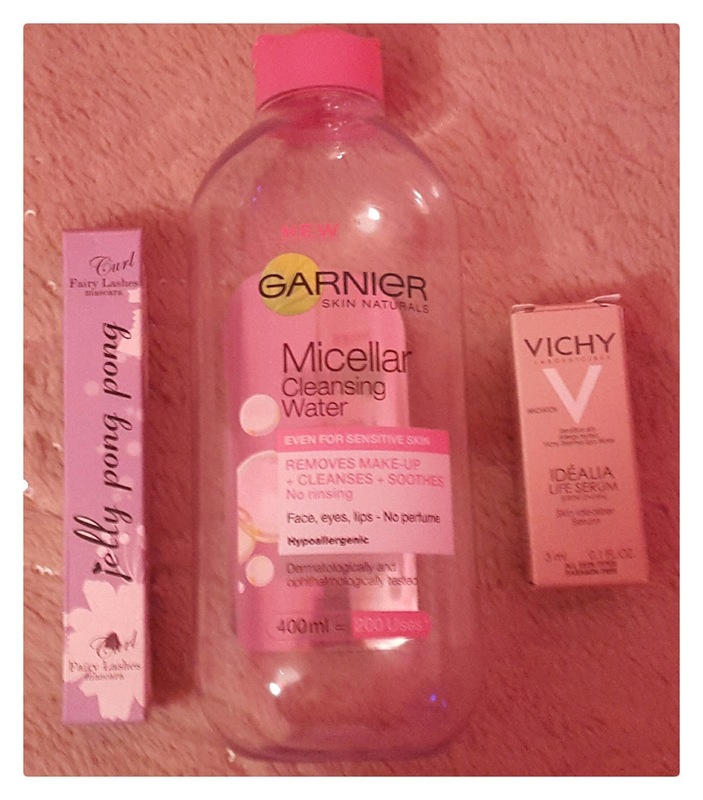 Everyone knows how much of a fan of the Garnier Micellar Cleansing Water* I am, if you haven't read my view about this beautiful product then you can do so by clciking here. Jelly Pong Pong is one of my favourite makeup brands, I got this little beauty inside one of my monthly subscription box's, this mascara is so great and really made my eye lashes pop. Lastly is a Vichy Serum* which was sent to me by Vichy. I've really found that this little beautiful helped me skin a lot so I would recommend it to someone with acne skin but not someone with oily skin as it did make my skin really oily. 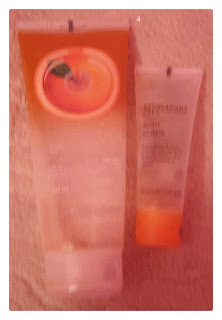 I mentioned the Neutrogenar Visibly Clear Pink Grapefruit Daily Scrub* in My Summer Morning Routine, everyone knows how much I love this product. This product really cleared up my achne and my eczema so this is right up there on my recommended list of products ever. I've mentioned in the past about how much my scalp has been dried out and sore since bleaching my hair last year and I thought I would try the Naturoil Argan Oil Hair Mask* to see if tis would work for me. Although when using it, it did make my scalp tingle a small amount, I loved how clean and silky it made my hair feel and look. 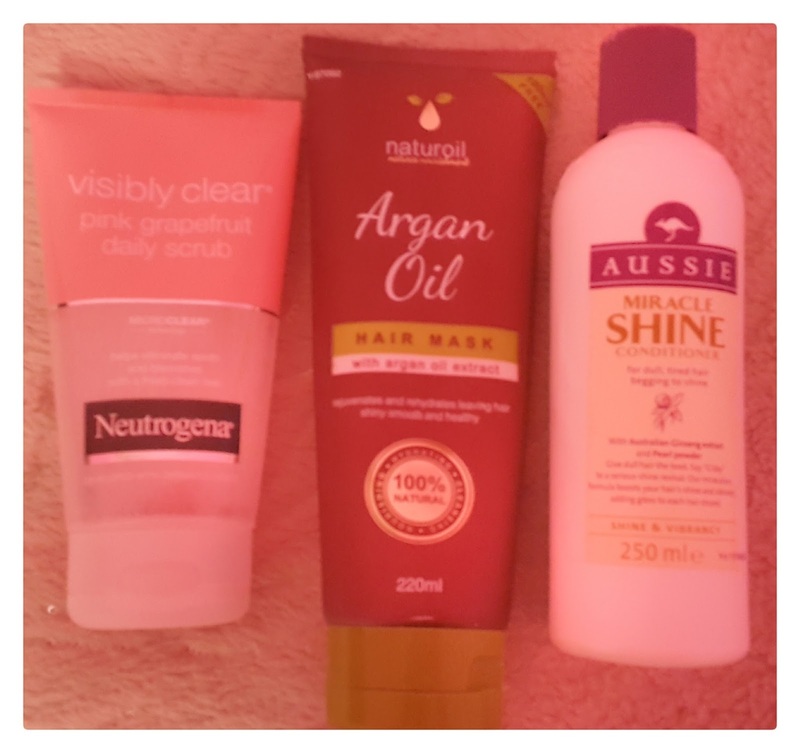 I mentioned the Aussie Miracle Shine* in my Big Autumn Haul and since then Aussie got in touch with me and asked me if I'd try out some of their other products - of course I agreed! It's Aussie, who wouldn't?! Every single Aussie product you can get your hands on, buy! And buy in big amounts! Aussie is such a fantastic brand, it's really helped my hair and my scalp. 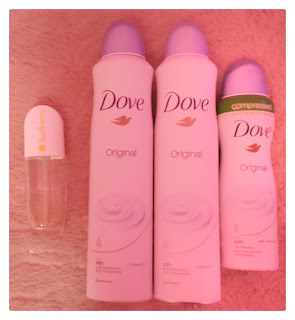 Just like you can see above, I also adore Dove deodorant. It really smells wonderful and keeps me feeling fresh all day long. Sunflowers perfume reminds me of high school as its a perfume I wore when I was in high school, I've been wearing it a lot over the past few months and I've finally ran out. 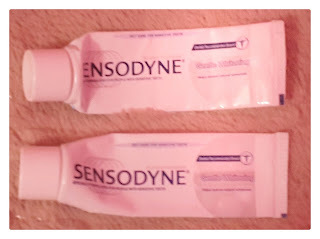 I thought I would keep these and add them into this blog post because Sensodyne Gentle Whitening Toothpaste* have made such a difference on me that I thought everyone should at least give these a go. 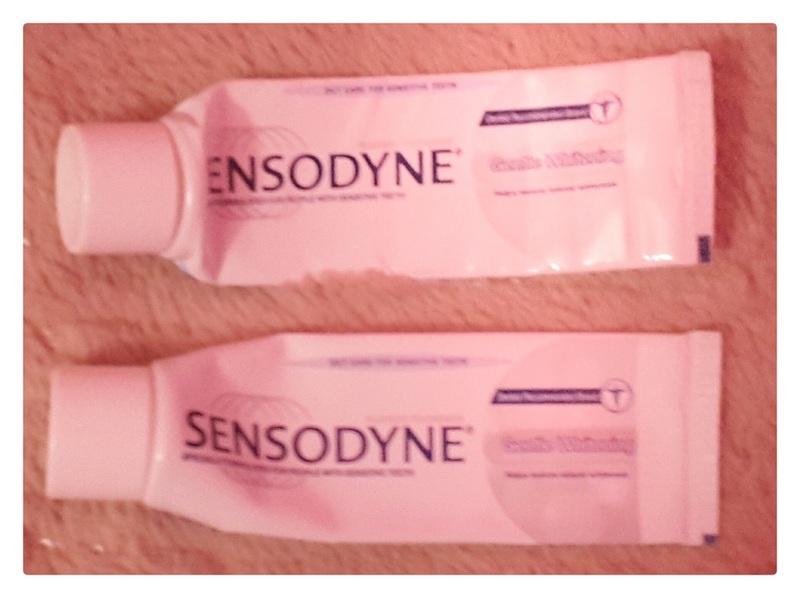 I have really bad sensitive teeth and just like everyone else lately I've been wanting whiter teeth myself, and I was a little worried about trying new things to whiten my teeth due to the fact that I didn't want it to go wrong and I end up with toothache. I made a jump and decided to try this - and I'm so glad that I done so because I love them! They have really brightened my teeth up without making me feel extra sensitive or my gums feeling tight and sore. I hope you all enjoyed this blog post. If you would like to see a full detailed review about any of the products mentioned above them please feel free to contact me and let me know. I hope you all have a wonderful day! I loovvvveeee Dove. When people ask what smelly set I want for Christmas it's always Dove. Check out the asda nspa fruity body range, they some great scents to choose from.